Ostankino TV tower (540m) is the tallest freestanding structure in Europe. You can enjoy the view of Moscow from its two observation decks: the glassed deck (337m); and the open observation deck (340m). You can only access the open observation deck from April to October and during favorable weather conditions. The TV tower was designed by Nikolai Nikitin and built in 1967 to mark the 50th anniversary of the October Revolution. The architect designed the tower silhouette overnight. An upside down lily, with a firm stem and four solid petals-supports, was an inspiration for the tower. Later Nikitin increased the number of supports to ten, following the advice of the world-famous German civil engineer Fritz Leonhardt. 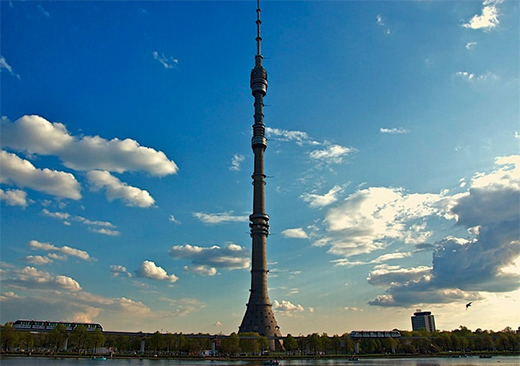 The Ostankino Tower is a very popular Moscow attraction and we recommend you book the visit in advance. The observation deck is open for visitors daily from 10:00 till 22:00. The tour lasts one hour. During the tour you will learn about the history, architectural and technical features of the Ostankino TV Tower and take in the picturesque panorama of Moscow from its observation decks. Not far from the TV tower are such Moscow highlights as the Ostankino estate, VDNKH park, the Space museum. Your Moscow tour guide can help you to design your Moscow tour itinerary. You can get to the TV tower by car or by monorail.